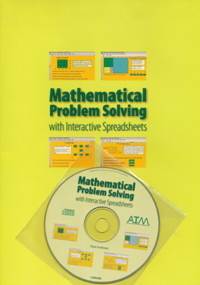 The CD associated with this book contains sixteen interactive spreadsheets which have been developed to pose interesting and challenging problems. The tasks, many of which are well known, have been transferred to this format to help teachers offer learning opportunities to pupils that help develop their skills of mathematical reasoning. The files will work with Excel and most other spreadsheet applications. The problems require little prior knowledge in terms of explicit mathematical content. The aim is to provide problems that are challenging but accessible to students in the upper primary and secondary age ranges. Most of the problems include a range of extension problems to challenge even the most able. The files are interactive so that as learners respond to the tasks and questions posed the next tasks appear on the screen automatically. The teacher�s guide offers suggestions for further extension and hints concerning solutions and proofs.